Every day we moisterise our skin but most of us do not think that our eye s needs to be taken care as well. I personally never have thought about hydrating them much up until recently so I was happy to review Biotrue rewetting drops. 10ml unique Biotrue rewetting drops dispenser: Biotrue® rewetting drops 10ml’s innovative Control Grip system simplifies handling and gives you peace of mind during use. It is preservative free and can be used for six months once opened. It contains 0.24% hyaluronic acid. Single dose: Easy to administer, this handy single dose unit is particularly convenient for travel and the ideal companion, whether in the office, during leisure time or while travelling. It is preservative free and contains 0.24% hyaluronic acid. Fact: Hyaluronic Acid can retain almost 100 times its weight in water to keep our eyes feeling hydrated. 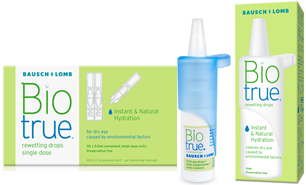 Fact: Biotrue® rewetting drops deliver instant and natural hydration because of their specific preservative free formulation based on hyaluronic acid. Fact: Whilst most of us moisturise our skin every day, we forget that our eyes are also exposed to the environment, including air conditioning and heating, and can become dehydrated. Digital technology, especially spending long hours at a computer screen, can also take its toll on our eyes as our blink rate reduces and as a result our eyes are less lubricated. I have been suffering from dry eyes lately and I couldn't wait to try these drops. I have tried Biotrue rewetting drops a few times during the past 2 weeks right after walks with the dog because the wind really dries my eyes and I am really liking these drops. They have been working better than an other brand I had tried recently. Unfortunately these drops are not available in Canada yet but hopefully it will soon. I know if I see these in stores out here I will be buying a bottle. It is launching in Boots in the U.K. , and you can also find it in Superdrug .